The New England maritime theme of Columbia Harbour House features various sea faring items adorning the walls, and is complete with creaking wooden floorboards when moving from room to room. And there are quite a few rooms, upstairs and downstairs. The various seating areas are nicely separated, even though the restaurant itself is quite large. Various seafood sandwiches are available along with fried shrimp and chicken baskets, grilled salmon, clam chowder, lobster rolls, and salads. A few select deserts are also available. 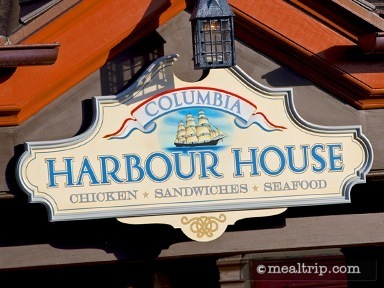 One of these days I'm going to get back around to trying some seafood dishes at Columbia Harbor House! Today though, we're taking a look at the Broccoli Peppercorn Salad. Why? Because maybe everyone in your group doesn't want fast food seafood... all at the same time. Answering the question… so what else do they have at Columbia Harbor House? Well, they have a Broccoli Peppercorn Salad, and you know what? It's not bad. It's easily on-par with any fast food style designer salad we've found outside the gates. Is it up there with the best "Soup & Sandwich" shop kind of salads? Not really. It's missing a couple more ingredients and more contrast, but it's a really good entree for a fast food fish place. The parmesan cheese that tops the chicken (see photo) could have been more plentiful (and flavorful) and that could be said for the dressing as well (I do tend to go a bit overboard on the dressing though). The broccoli was great and the chicken itself was a decent piece of basic roasted chicken. The sunflower seeds (which mostly fall to the bottom of the bowl) surprisingly did not provide much crunch. They weren't "stale" per say, and while I hate to suggest upping the sodium levels on something like this, if you dry roast those little seeds in some salt and spices, they'd stay crunchier. All in all, I'd totally get the Broccoli Peppercorn Salad again. It's one of the lower cost items on the menu, was a decent size, and you felt good about eating it… which is sometimes hard to do in the middle of a theme park. Because I ate such a healthy main entree, I also wanted to try out the Seasonal Cobbler. Oddly, no one was particularly certain as to what season we were in… other than to say that there's usually some kind of fruit in there. I hate making fun of this little dessert because it was really, really good. 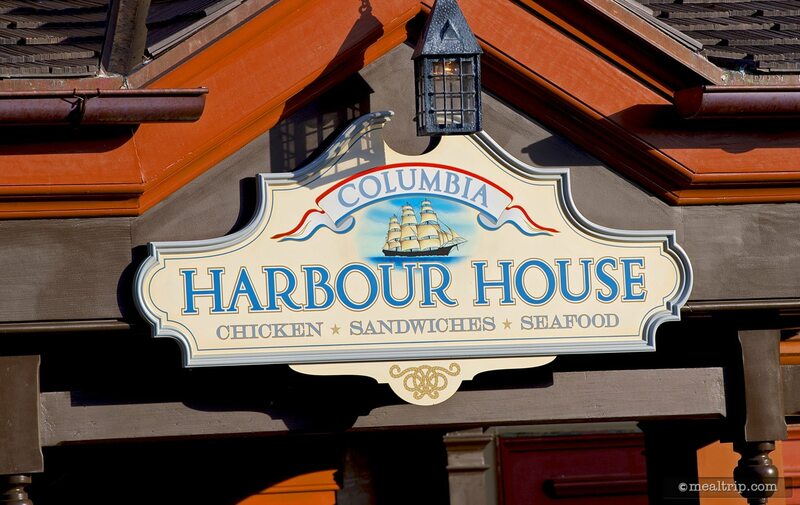 I'd go so far as to say, if you're at Columbia Harbor House… get one. 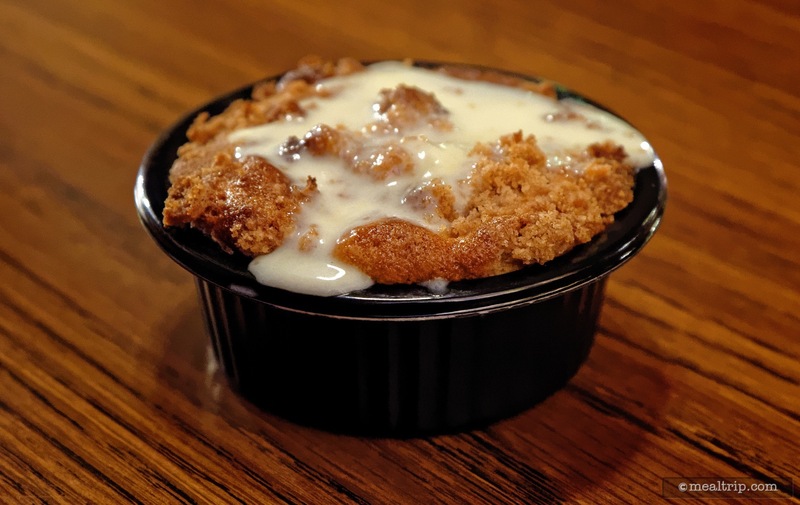 I'm fairly certain mine was blubbery, and while it's blueberryness didn't really come forward in flavor... the sweet, warm cobbler was soft on the inside and crunchy on the outside, with just the right amount of a basic vanilla milk glaze oozing over the top. This cobbler… was better than the salad. Oh sure, you could make it fancier, but considering this is a fast food location, I was really surprised and pleased by the quality of the little cobbler. The line of guests waiting to order at Columbia Harbour House can, at times, be quite long. Case in point, this is my third attempt to stop in for a sandwich at the long standing staple of quick service maritime dining at the Magic Kingdom. There is a point, after lunch and just before dinner… say around 4:30pm, that the lines are short and the restaurant is relatively empty… just how I like my quick service restaurants. Wood bits cover everything in the two-level dining area. Both levels are ship-like with the bottom being a little more closed off feeling, somewhat like a galley or the crew's mess hall on an old wooden sailing vessel. The top level is slightly more open feeling, partially because of the windows and skylight area in the center, that looks down over the food ordering and pickup area. It is a really well-done theme. There are ship knots, dive bells, harpoons, detailed figureheads (those carved wooden figures attached to the front of old sailing vessels), and nautical paintings everywhere you look. The wooden floors on the stairs and on the entire second floor even creak, if you step on them just right! In so much as the cast members try to keep the table surfaces and floors clean (thankfully), some of the nick knacks seem like they've forgone any sort of cleaning in years. Some of the model ships that have been placed in glass boxes come to mind. The glass on the one I was sitting next to was so cloudy, you could barely see the ship inside. I get it… it's a high-volume location, but if you're going to have the stuff out there, you've got to keep it clean. Getting back to my sandwich, the "Anchors Aweigh Sandwich" has been on the menu for a long time. It's basically a good, solid take on a tuna fish sandwich. 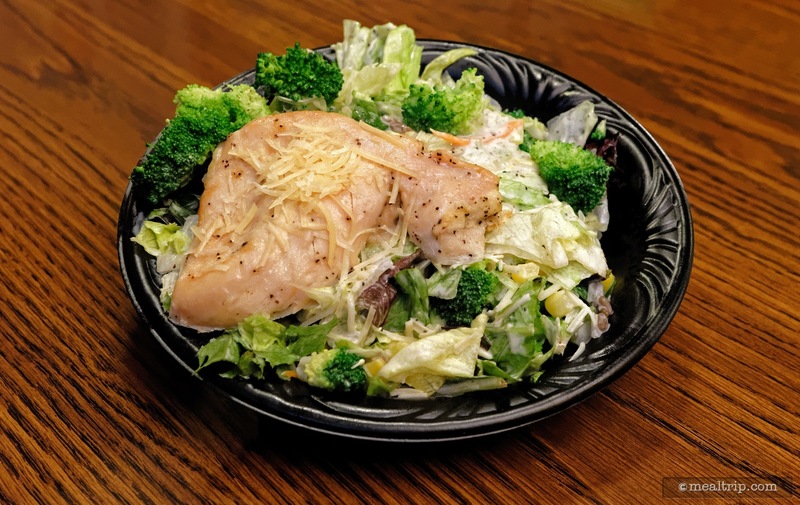 Eating healthful at the parks can be difficult sometimes, and so it's really nice to find something that's not battered or swimming in sauce. The multigrain bead used here, balances well with the white tuna, while the lettuce and tomato add a crisp and juicy note to the sandwich. The house-made style chips served with the sandwich are good, but you're not likely to ever get them "made to order" (which is when they are at their best), they are fully allowed to cool before being used at this location. All in all, it's a good, basic, tuna sandwich… that unfortunately, also lacks any real "wow" factor. If there was simply more tuna, lettuce, and tomato in there, you could say "wow, this thing is packed full of stuff, I'm totally getting another one of these when I come back"… or if there were some unique (and healthy) item added to the sandwich itself… like sunflower seeds, or asiago cheese shavings, black olives, or an artesian-style seven grain bread… it might have that "I have to get another one of these, I've not had a tuna sandwich like that anywhere before", quality to it. That's not bad per say, it's nice to find a basic sandwich... but with a price that rivals or exceeds what you'll likely find at niche fresh bread/cafe shops across America, you're left wanting just a little "wow" (and a little more sandwich, truth be told). 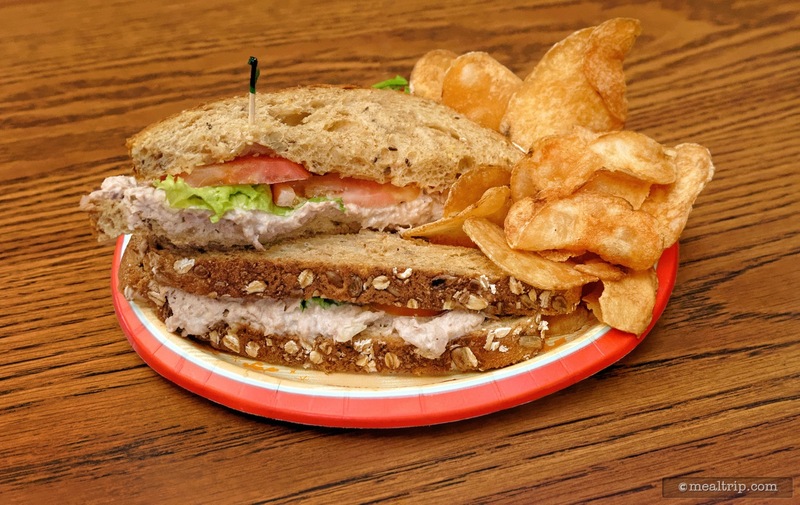 The Tuna Salad Sandwich at The Plaza Restaurant (for example) is a full three dollars more… but is delivered on a freshly baked croissant, which is not something you'll find everywhere. Fortunately, there are many things on the menu to try at Columbia Harbour House, and now that I know what time the crowds have "abandoned ship", I think I'll give a hot menu item a try next time!